Five Star Professional Award for Fourth Year Running! 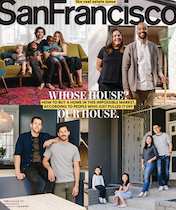 I was gratified to receive the Five Star Home Professionals Award for the fourth year running in the November real estate issue of San Francisco Magazine! 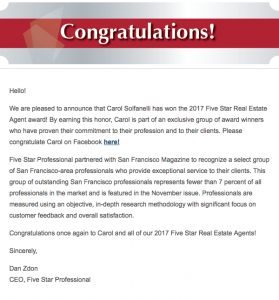 The final list of 2017 San Francisco Five Star award winners represents 9 percent of real estate agents in San Francisco. Five Star Home Professionals partnered with San Francisco Magazine to identify agents who deliver outstanding service and customer satisfaction by contacting thousands of recent homebuyers and other consumers who rated agents on criteria such as overall satisfaction and whether they would recommend the agent to a friend. So please contact me if I can provide you with the same outstanding service I have for many others! Previous: How to Solve the Most Common Obstacles to the Sale of A Home! Next: Great Value in a Less Known Gem of an SF Neighborhood!